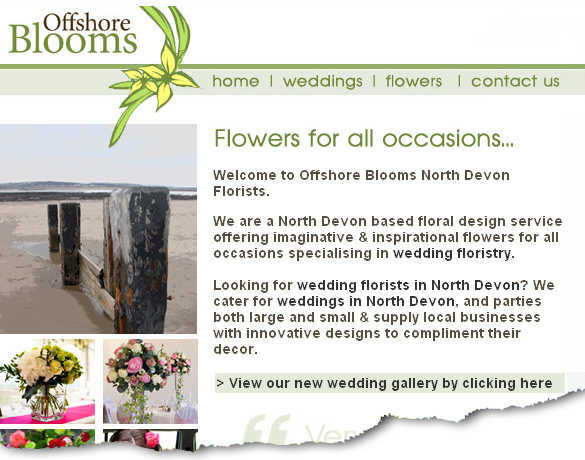 Sims Designs designed the Offshore Blooms (North Devon Wedding Florists) website and then we optimised all the site pages for their chosen search terms. They were interested in gaining a top ten position in Google for their new website. As the site was new, patience was the key. With any new site, it can take up to six months to get listed in Google for targeted search terms, so a 'softly, softly' approach was required. After the site was completed we concentrated on the number of links that the site had to it and the quality of links. This coupled with periodic updates to the site helped us optimise the site successfully for the client.